Forget the crucial left-right matchups that create agony for managers at this time of year. Over the coming week, the toughest decisions in baseball will belong to Gina and Alex Butera. 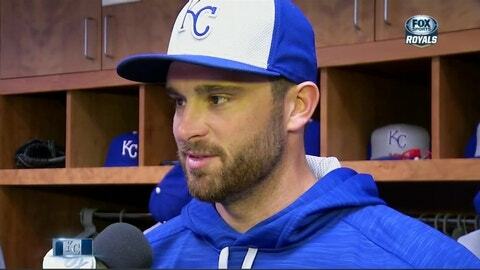 Sal Butera and Drew Butera — father and son — are on opposite sides of the American League Championship Series; Sal is a coach on the Toronto Blue Jays’ major-league staff, and Drew is the Kansas City Royals’ backup catcher. Sal is a former big-league catcher and longtime scout who has recently transitioned into coaching. Drew has caught in the majors since 2010, but they’ve never opposed each other in a major-league game. Asked what allegiances his mother and sister will have during the series, Drew quipped, "They’re both going to wear blue." In this rare instance, the convergence of color schemes will afford Gina and Alex at least the appearance of neutrality. While such father/son coach/player encounters in the postseason are rare, ace researcher Aaron Charlton of STATS LLC tracked down one such instance: Todd Stottlemyre (then of the Texas Rangers) started Game 1 against Mel Stottlemyre’s New York Yankees in the 1998 AL Division Series. However conflicted Gina and Alex may feel now, they can take solace in this fact: One way or the other, the Buteras are going to the World Series.